If you are the kind of person who shrugs with boredom whenever governments send you an update on policy changes, you might want to take a closer look the next time one lands in your mailbox. 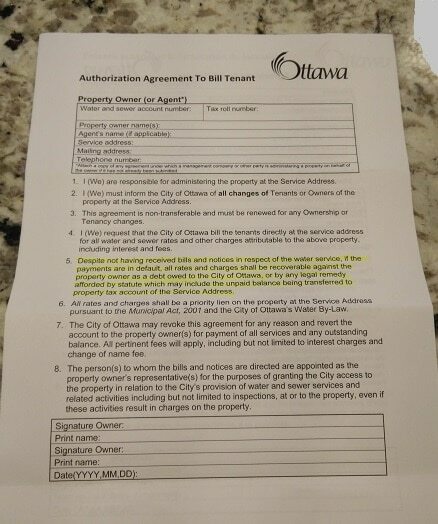 Earlier this month, I received a notice from the City of Ottawa that has the following headline: Water Billing Options for Landlords and Tenants. I assumed that if the City is reaching out to us, it’s not because they decided to increase the number of options we have available. I was right. There are big changes afoot when it comes to water and sewer billing in the City of Ottawa, and they will have an impact on real estate investors. Here’s how the letter begins: “The City of Ottawa is introducing changes to the water and sewer billing options for landlords and tenants to reduce the City’s administrative costs and protect the City’s water and sewer revenue.” In short, landlords will now be on the hook for more potential costs because the city is looking to offload some of its risk factors. The landlord can keep the bill in his/her name and collect from the tenants themselves. The landlord can have the City bill the tenants, but the landlord is ultimately responsible for unpaid charges. The landlord can set up a Tenant Lease Agreement whereby they send the City a copy of the lease, and the tenant becomes fully responsible for all charges. If there is a balance owing when they leave, the City chases the tenants for repayment. Currently, all of my leases are set up as Tenant Lease Agreements, which means that the tenants are responsible for their charges. Effective January, 2017, the City will no longer accept Tenant Leases on behalf of landlords. Any existing Tenant Lease Agreements that are in place will be honoured, but for new tenancies from January 1st onward, the City will only accept an “Authorization Agreement to Bill Tenant”. Here’s the problem from the landlord’s perspective: they are responsible for the tenants’ expenditures. If the tenant fails to pay, the City will go after the owner. Despite not having received bills and notices in respect of the water service, if the payments are in default, all rates and charges shall be recoverable against the property owner as a debt owed to the City of Ottawa, or by any legal remedy afforded by statute which may include the unpaid balance being transferred to property tax account of the Service Address. So even though you do not see the tenant’s bills, you, the landlord, are responsible for the charges in the event that the tenant fails to pay. If the tenant bails on the unit and leaves you with unpaid water and sewer charges, you need to pay up. Otherwise, the city will use its power to either add the charges to your property tax bill or hold you liable using other legal remedies to which it has access. The challenge with this approach is that you will not always know if there is a problem with the tenant’s bills. I have seen cases where the tenants pay the rent every month because they want to ensure there are no problems with housing, but delay paying their utilities when cash flow is tight. What if you do call the City and find that there is a growing, overdue water and sewer bill? What can you do? According the Landlord’s Self-Helf Centre, you can issue an N5 Notice to End your Tenancy For Interfering with Others, Damage or Overcrowding, but that will simply result in a terminated tenancy. You still have the outstanding charges, and to recover those, you need to take the tenants to Small Claims Court. Your level of risk, and potential costs, just went up. I do understand why the City is revoking the Tenant Lease Agreement and making owners responsible. It’s currently a huge burden to bear for the City. That said, what I would like to see is a mechanism that lets landlords know automatically when water and sewer bills are in arrears, perhaps in the form of an email notification. If landlords are to be held responsible for their tenant’s usage, then they need to have timely information to be able to act promptly. Asking landlords to call the City for information is cumbersome on both sides of the equation. It’s onerous to ask landlords to keep calling in at regular intervals to ensure that all is well, and it’s not a great use of the City’s time on the receiving end to have to check into tenants’ accounts to pass along information. The bottom line is this: Carefully read the notices that come your way as they do have an impact on your investments. Follow up to ensure that you fully understand your rights and responsibilities, and, for those of you who live in Ontario, put a system in place to ensure that your tenants’ water and sewer bills are being paid.